Have you ever been stuck in the predicament of planning your family vacation and you have to split up your family due to lack of beds available in one room? Sure, some hotels and motels may offer cots, but no one is really that comfortable sleeping one on of those. At the Freer Executive Inn, located in Southern Texas, you’ll find family suites available for your whole family! 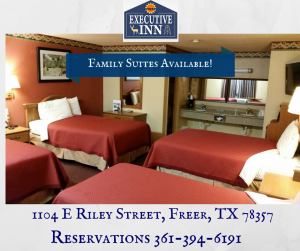 You’ll be able to sleep about 7 people in one of our family suites! The room is also equipped with free wifi, a desk, table, microwave, fridge and much more amenities for your family to enjoy. To learn more, visit our website, or give us a call at 361-394-6191 to book your room!